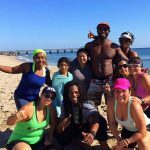 The Fit Life Formula showcases one of South Florida’s premiere personal trainers, Diontae “The Animal” Smith. In today’s society where trainers are everywhere, The FLF has come up with a unique and necessary platform to highlight some of the world’s best personal trainers, yoga instructors, Zumba teachers and also the more unique fitness centers across the country. Click the play button and get up close and personal with Diontae in this edition of the FLF unplugged. Cannot express enough how excited I am to get up every Saturday morning for the Boot Camp E. Atlantic Blvd,on the beach so excited to work out with amazing trainer we get the work done .You feel amazing after come out and see what I’m talking about you will not regret it ??????????? ?